As part of the information science related, today’s accounting practices can not be untied from using of information technology – mainly computer – that is used to input, process, and blend accounting data to become information that is used for decision making. In the information concept, we know the term Input -> Process -> Output, or known as I-P-O. There is term like that also in accounting information system. Input in the accounting term is documents or transactions evidences as the basis for accounting journal entry records. These base documents for the input are such as bill (electricity, water, telephone, rent, toll road, and tax), letter of contract agreement, sales invoice, payment slip, and cash receipt. Process is started from recording the transaction based on related document into journal entry (either special journal or general journal) up to generating trial balance. Production head: as a feedback to control costs incurred under their responsibilities. Marketing head: as a feedback of sales has been achieved, recorded, and recognized by the company. Top management: to decide financial strategic policy such as financing, dividend policy, bonus payment, expansion, merger, research, etc. In principle, accounting report – for the internal interests – is more used as a control function of the top management up to lower staff in the clerical level. For the external interests, accounting report is used for audit purposes, re-funding to financial institution such as bank or strategic investor, as a prerequisite of transparencies principle by stock exchange regulators, tax calculation and audit. Understandability: to be understood, user must understand terms related with accounting such as what the meaning of account receivable, cash, account payable, accrual, depreciation, etc. are. Relevance: whether the accounting information provided is related with past, current or future. Timelines: the accounting information should be presented right on time. Completeness: the accounting information should be presented completely and nothing left behind. Representation faithfulness and neutral: accounting information should be presented without any purpose; purport what it should be purported. Verifiable: the accounting information should be verifiable or traced back to its original base documents. Feedback and predictive value: based on the provided information, user may decide any necessary actions for future events. 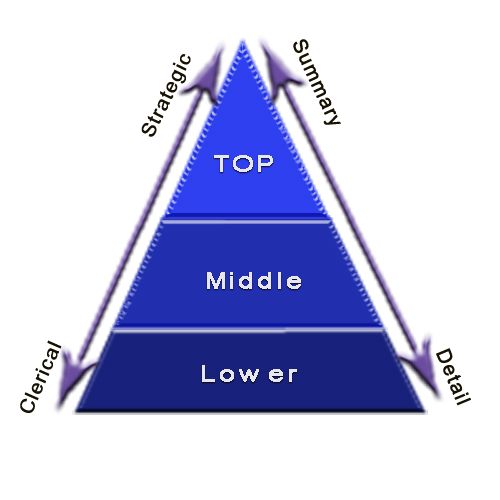 Top management: receive summary report, and strategic in nature. Depend on the type of business, its time horizon may be 2 to 5 years. 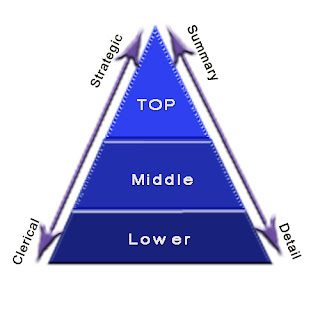 Middle management: can be summary or detail report and operational in nature. Its time horizon is 1 to 2 years. Lower management: mostly detail report and tactical/clerical. Its time horizon is less than one year. Report made for the top management should reflect what events and transaction occurred in the middle and lower level. Here, accounting information system plays an important role. AIS makes financial report for various user and interests, from the detailed up to summarized report. Besides financial report, non-financial report can be included. Non-financial report is used as supporting or corroborating information so that when the report to be analyzed further, user will know whether the financial report is presented fairly or not. Examples of non-financial report are number of head counts, inventory items fixed assets, stock issued, and product market shares.